Today I’m sharing something new with you that I hope you will take just a minute to stop and think about. I’m participating in the virtual progressive fund-raising dinner, Share Our Table. This seven course dinner which is being brought to you by 50 different food bloggers, is designed to raise awareness and understanding of child hunger in the US. Food is something most of us who are writing or reading food blogs takes for granted. Even if you have a modified diet and you are looking for different ideas, you still are making food and not dealing with hunger. MORE THAN 50 MILLION AMERICANS STRUGGLE TO PUT FOOD ON THE TABLE. MORE THAN 17 MILLION OF THOSE AFFECTED ARE CHILDREN. What can you do? You can support Share Our Strength’s NO KID HUNGRY campaign to ensure that no kid in the US goes hungry. NO KID HUNGRY has made a commitment to end childhood hunger in America by 2015, and they need your help. 1. Visit the Share Our Strength’s NO KID HUNGRY website. 5. Spread the word. Tell your friends and family about it. Are you a blogger? Visit Share Our Strengths’ Blogger Resource Center to find out how you can help. Today’s I am joined by 14 other bloggers sharing side dishes in the categories of Gourmet, Family Friendly, Vegetarian and Gluten Free. My fellow gluten free blogs are Jenn Cuisine and Creative Cooking Gluten Free. Check out the complete list or head to the bottom of this post. Now on to the recipe. Today I’m sharing a wonderful creamy tart free of gluten, dairy, and grains. It makes a wonderful side dish to ham, fish, beef, poultry, and just about any protein. In fact it can be a meal on it’s own. The dish is inspired by Jamie Oliver’s tart from his cookbook, Jamie at Home: Cook Your Way to the Good Life . His tart is full of dairy and he uses filo pastry which of course contains gluten but it uses real food. I find if you have recipes made with whole or real food ingredients, it’s usually really easy to adjust or change it up to suit your needs. The point is to cook with as many ingredients as you can that doesn’t have a food label. Follow the directions and pre-bake your tart in a tart pan. If you don’t have a tart pan a pie plate will work too. A tart pan will make it easier for you to remove the tart and slice it with the removable bottom. Remove the tart shell from the oven just as it starts to brown unlike me who was mesmerized by the football games and left mine it too long. Peel your potatoes and cut into chunks. Boil for approximately 15 minutes until cooked. Next you are basically making mashed potatoes. I put my potatoes through the ricer, add in the olive oil and milk. Mix them together until they are creamy. Add in the salt and pepper and give it a little taste to see if you think it needs more salt. Next add in the sour cream and again mix well. Now make a little well in the center of your bowl and add the eggs so they can be beat a little before incorporating them into the potatoes. Once all of this is mixed together really well, add in the chives and combine. Now pour this potato mixture into your pre-baked tart shell. 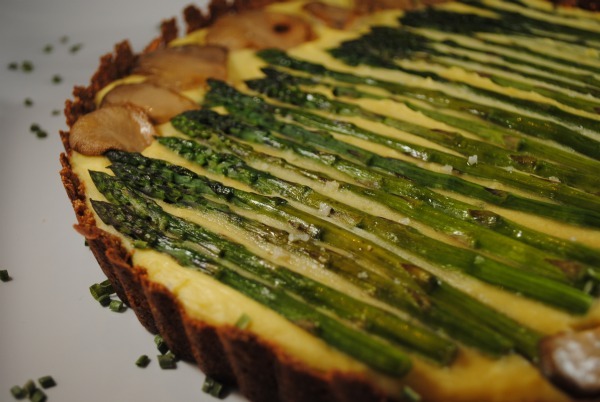 Carefully place the asparagus from the center out to the edges. Add in the oyster mushrooms where there are spaces on either ends of a round pan. Brush it all with a little olive oil before putting into the 350 degree pre-heated oven to bake for 20 minutes. 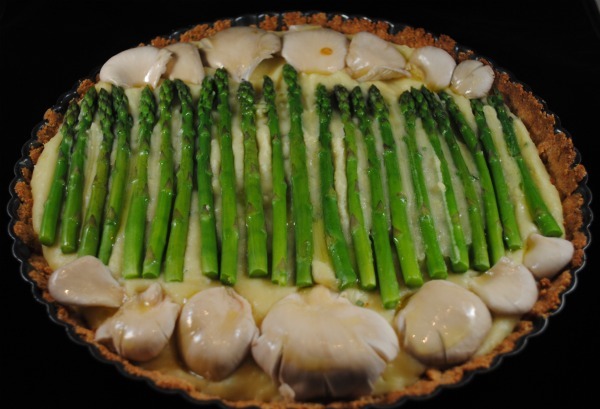 When it’s done baking remove it from the oven and sprinkle some course sea salt on the asparagus, let it sit for 10 minutes before you cut into the tart. If you don’t have oyster mushrooms, use what you have on hand or leave them out. The sour cream I used is made with soy. If you don’t eat dairy or soy you can leave this out completely. If you eat dairy you can use regular sour cream or even a mild cheese shredded. Feel free to change up the type of milk you use and you can sub out the olive oil for your favorite butter. This recipe was also shared on Ginger Lemon Girl’s A Gluten-Free Holiday- Breakfast and Brunch. Head there before Wednesday 10pm for your chance to win a gluten free cookbook! Check out all the great recipes shared today! Jenn Cuisine– A mostly gluten free cooking blog. Beautiful tart and happy to be one of the gluten free bloggers sharing today's side dishes with you! Thanks so much for participating in such a great cause, I hope we're all able to recruit a lot of donations! Thank you Jenn. That would be so wonderful if people would donate. Doesn't have to be much but if a lot of people do a little it will help a lot. Beautiful tart! Do you know of any dairy-free sour creams that are also soy and corn free? Sarah- the only thing I know of is a cashew cream made from cashews and nothing else really. I've never seen it out to buy and I've not made it but I hear it's easy to make. On my list for 2011 to try. Let me know if you try it. So happy to participate in this incredible worthwhile charity event with you and so many others! Thank you Shirley. Glad you liked the photo that much. Maybe I will submit it. I keep thinking I'm going to do that and then it slips away again. Marla, thank you. It is great to get to help. this looks delicious. it was fun sharing a meal with you today! Michelle it was so great to participate. I wish I could have done more. Let me know if you make the tart and what you think. Thank you SO much for sharing this on my "A GF Holiday: Breakfast/Brunch Roundup!" The Share our Table is such a great event Diane! I love seeing the meals you've added to the list! Diane- SO beautiful. So so beautiful. Bookmarked.